I asked Tim Patterson, @tradeshowguy, VP of Sales and Marketing for Interpretive Exhibits, Inc., in Salem, Oregon for this guest post about the benefits of Trade Shows for promoting your business. 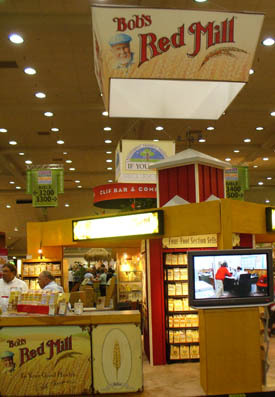 Interpretive Exhibits, Inc. specializes in design and fabrication of trade show exhibits. A tradeshow is a great marketplace for finding a targeted audience, most of whom are PAYING for the privilege of being there. Many are buyers or people who can recommend your product to the right people in their company. Nothing beats a face to face meeting. With a tradeshow, potential buyers will stop by your booth and you’re able to engage them in conversation, learn their problems, offer possible solutions and lock down the next step in the sales process. Depending on the industry; this could be a very effective way to reach potential customers. In 2001, the average business-to-business sales call cost $329, according to Cahners Research. The Trade Show Bureau says the cost of an average tradeshow lead is $142. The numbers will vary from company to company, but it’s a sure bet that trade show leads cost you less than a sales call. Trade show Events, Just like business get together for small business owner and large scale business persons, where they meet each other to get a chance to move higher. Falks use to marketing their business, products, and brands to get more potential customers lead. Nevertheless, You heard right!! Hubspot refuse to participate in trade shows because they have found another inbound marketing way that could lead them inexpensively. Whatever the reasons and research say but its also true trade shows still consider as a key-turned marketing platform. Trade show exhibits are the best way to represent our business as well as help to grow our business. These trade show also help us to meet new customers under one roof. Going to a trade show just to go is a huge waste of money. You must have a purpose and know your goals before going into a trade show. Thanks for sharing! As well as strengthening branding, tradeshows are a great opportunity to network with other businesses and get your name out there! I totally agree with Tim! Being on a trade show could bring many benefits to your company and it is a great opportunity to test that new product that your business has always been wanting to see what would be the reaction of the potential consumers.Thanks for sharing. Spying on the competition is a very valuable and convenient part of trade shows. Always take advantage of it. I can definitely see why you’d want to invest in quality equipment and displays for a trade show. There are a ton of benefits that can come from participating in one. The trick is making sure that your display attracts attention and encourages engagement with your product and/or brand. I think the best way to do that is to have the right supplies. Following on from #4 I would also say that meeting your potential customers face-to-face can be great for learning their *language* – the specific words and phrases they use. These can then be used to tailor-make marketing materials in the future that speak specifically to these people. Trade shows are great for qualified leads but you must do follow up. Make sure after the trade show is over you follow up while your company is still top of mind. Don’t spend all that money at a trade show just to build brand recognition, convert some customers as well. Trade shows are indeed an excellent and creative way to promote. It is also about establishing trust and relationships. Make sure that you do have appealing trade show displays. Trade shows can be a great opportunity to meet people in your industry, or potential customers, clients, or partners! Whether you’re going to be hosting a booth at a trade show, or just visiting, be sure to have the proper documentation so you can leave people with business cards, brochures etc. Get your name and contact information out there in addition to increasing your brand presence and identity. Great article! Nothing beats the excitement at a tradeshow. If you can get the ball rolling, tradeshows can be such a huge asset for your business! Not going cheap on your materials and making sure you look professional are huge things for me. I think the most important reason to be part of a trade show is simply to get face-to-face time with potential clients. Nothing brings in more clients than a direct conversation about what your company does and how you can help them. Tradeshow is much more important for marketing. It makes real face to face connections.Thanks Tim!! Tim, Nice summary about the benefits of trade show exhibiting. Your last point (#12) about not getting a booth and instead setting up shop at a nearby hotel might be a little controversial though. I’ve heard some shows are trying to crack down on this practice, which seems to be growing due to the economy. Anyway, I’m glad you’re recommending trade show marketing. It is a great way to market! Good stuff! I like the idea of testing a product or doing market research. A tradeshow is the perfect place for doing some testing or retraining your employees. Also a great tip is to set up shop in a hotel room if you can’t get a booth. I’ve never really had the mindset for face to face marketing. Maybe when I expand I can hire people to represent my company at trade shows though. You make some really great points in this post, I would just like to add to point 4 about meeting your prospects up close, you will also get the opportunity to meet rival companies prospects up close, after all, bigger firms in the same sector as you will have invested a lot of time and effort marketing to their prospects database before the show, piggyback off that and capitalise on all those prospects who didn’t know that your company could offer the same product or service cheaper – or a better product or service for the same price as your larger competitors! You can make a big splash – even with a small stand! Smaller companies should also keep in mind that many of the clients that would be perfect for them are not who those bigger firms like to work with anyway. It can be a very good idea to collaborate with them if they’re willing as they might throw the clients that are too small for them your way. That is a win-win-win because they don’t have to waste time on customers they don’t want to serve, the customer finds a company that wants their business, and you have a new source of quality leads. Trade show is costly but I believe it is one of the best way to promote your products to the public. Thanks for the post! I just got out of business school and only had one professor that mentioned anything about trade shows, and he highly recommended them. It is nice to find a post that gives me more information about why they are important. I found the information very helpful. Great post Tim, it’s actually very important for a businessman to give a better exposure to his business and exhibitions are really good source for this. The exhibits these days are very high profile and have many high profile businessmen featuring there, searching for new and and better options for business which is very good for new businessmen to showcase their products and business strategies. Tradeshows are also really great for networking! Good tips and for success of business, it is necessary not do on online struggle. Work for each tip and get fruit juice. At present using only online methods to promote your business is not enough. Only the combination of online and offline ways of promoting is effective. Even those companies that work mainly online take part in various exhibitions and trade fairs to talk face-to-face with potential customers. Nowadays this aspect – interpersonal relations – is also important for being successful. An exhibit may not bring that many sales in that exact moment, but you can build a name for yourself that way. People hear of your business, and news spread fast. Plus you can take some quality pictures, post them on your site, people will have a better opinion when they see you’ve presented your products on such an event. They’ll start taking you seriously (if they didn’t already). Thanks for the tips Tim. I know that HubSpot has said that they no longer participate in trade shows because they have found that inbound marketing is more effective and has a lower cost per lead. Do you have a response to this? Google: “Why Hubspot won’t exhibit at trade shows and events anymore” to see their article. yep, Wedding fairs are great for me, it’s one of the few opportunities I get to meet other wedding professionals and build relationships with them. The fact that many brides to be pop along usually makes it a much better day. Hi Tim, the article was definitely an interesting read. Do you think, though, that trade shows are better geared towards businesses offering certain types of products/services and may not come in as handy for others? Yes the effectiveness does largely depend on what niche you are in. Certain items definitely won’t do as well at a tradeshow. Then again, sometimes you won’t know for sure until you take the plunge. You may be surprised at the results you achieve. Establishing just a few quality contacts may make it all worthwhile. I also think it’s a good idea. Started my niche blog August last year and will be going to the local with a very inventive and original approach. Will post about it in August. In my opinion when taking part to a trade show I believe that the most important things are to reach to your customers, present your product and market research. Thanks.